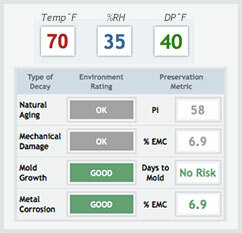 Both options raise the %RH but the preservation consequences are different. #1. Requires MORE energy to humidify the air and receives only an OK rating for Natural Aging. #2. Requires LESS energy to heat the air and receives a GOOD rating for Natural Aging. The PI Metric in #2 is 3 times greater than the original scenario and 5 times greater than option #1. Understanding the interaction of T, RH, and DP can help you plan, evaluate, and manage storage environments with respect to preservation benefits, decay risks, or the realities and capabilities of your mechanical system. Dealing with low RH levels during the winter season in cold climates is a common problem. 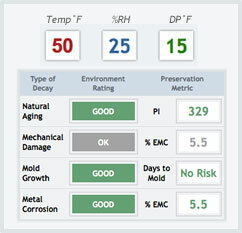 Dry conditions can have a negative effect on vulnerable materials. When the DP temperature is as low as 15°F (-9°C) there is very little moisture present in the air. Without humidification, the low outdoor RH is approximately the same as the indoor RH. The DP Calculator helps you understand what the consequences for indoor RH might be when the outdoor DP is very low. Move the Temperature slider to a human-comfort temperature (70oF). Notice the changing Environmental Ratings as well. 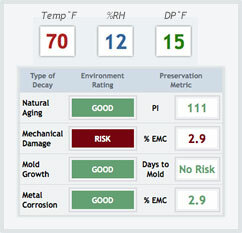 In the illustration above the resulting RH is very low and there is a risk of mechanical damage due to dry conditions if these conditions persist over several months.